The League of Women Voters Seattle-King County is organizing Ballots & Baristas – a night out for democracy. People are invited to go to designated coffee shops for discussions about ballot measures for this election season. 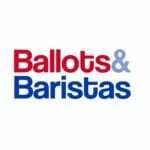 Ballots and Baristas events are held Tuesday, October 23rd facilitated by the League of Women Voters of Seattle-King County, a nonpartisan, nonprofit organization.